Often times when one thinks of an ice cream sundae, one thinks of gobs of hot fudge, right? Well, I have to say that's not always the case, at least not with me. Yes, I love a hot fudge sundae as much as the next person. But for me, it's all about the caramel. It's true! Ever since I was a child, every time there was a choice between chocolate and caramel, I pretty much pushed the chocolate aside. To this day, my hands-down favorite dessert of all time is a deep dish hot apple pie with vanilla ice cream and caramel sauce. Nothing else compares! So, I hope you'll give this sauce a try. It's really simple to make and it's ready in no time. And seriously, home made caramel? Are you kidding me? It just doesn't get any better!! Normally I'd list any tips and hints at the END of the recipe, but this time, you should read them BEFORE you make it. Safety first!! -First and foremost, be extra careful when you make this! -The sugar is SCREAMING hot when it melts and you could seriously burn yourself. If you have little toddlers running around, wait until it's time for today's nap, or let them watch something Disneytastic to keep them occupied. 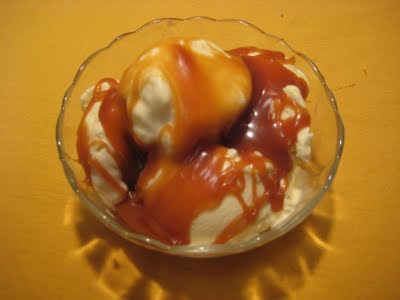 -Be sure to use a high sided saucepan because adding the butter and cream causes the caramel to dramatically bubble up. You definitely don't want it to overflow! -You may wonder why the recipe calls for 1/4 cup of water since it only evaporates from the pan anyway. Why bother adding it, right? To be honest, you don't need it. You can just add sugar to the pan and let it melt when you put it over heat. I like to add the water because it makes the sugar caramelize a little more evenly and you're less likely to burn it. It takes a few more minutes since you have to wait for the water to evaporate, but I think it's worth having a little extra insurance. -It's best to have everything ready when you start. As soon as the sugar starts to change color, it goes pretty quickly. You don't want to be routing around in the fridge looking for that last stick of butter while the sugar is burning. -After the vanilla is mixed in, let it cool for a while before pouring it into a heat resistant container, such as a mason jar. For heaven's sake, don't pour it into a plastic container! It might melt the plastic! And be sure to use oven mits when handling the hot jar. Whew! That was a lot. Ok NOW we're ready to begin! Place sugar and water in a 2 qt saucepan. Place over medium heat. Don't use any utensils to stir it. This will cause the sugar to crystallize. Just hold the handle and swirl the saucepan in a small circular motion. Cook the syrup until the water has evaporated and the sugar has turned to a lovely amber color. In the meantime, have the butter and cream ready. As soon as you've reached the amber color, carefully add the butter. Whisk until the butter is melted. Remove from heat. Add cream, whisking until well incorporated. Let it cool for just a bit before stirring in the vanilla. It will thicken to the perfect pouring consistency when it cools.